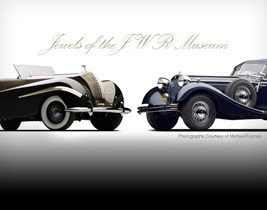 Pennsylvania resident John “Jack” Rich opened his collection at the JWR Museum after retirement so people of all ages could experience the wonders of automotive history. The AACA Museum will be showcasing six spectacular and diverse vehicles that span from the early 1900’s – late 1940’s in the main exhibit gallery. Specific vehicles include: 1910 American Under slung Traveler, 1926 Rolls-Royce Springfield Silver Ghost Piccadilly Roadster, 1932 Delage D8-SS Cabriolet by Chapron, 1939 Horch 853a Cabriolet, 1939/47 Rolls-Royce Phantom III ‘Vutotal’ Cabriolet by Labourdette, and a 1948 Delahaye 135M Cabriolet by Figoni et Falaschi. Also currently on display from the JWR Museum is an original and unrestored 1911 Oldsmobile Limited 7 Passenger Touring vehicle. It is believed that this is the only completely unrestored and original example know to exist.